A versatile material in the garden, burlap is used to wrap tree and shrub roots, mulch growing beds, protect newly planted seeds. I love adding strips of it to my worm bin. 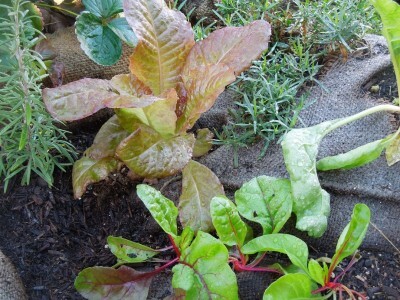 Red wigglers will devour the jute cloth along with the food scraps as they weave in and out of the fibers. I’m not sewing a stitch or covering plastic containers. My approach is more organic, free-form and natural looking. Once you view these ideas, you may dream up your own ways to use burlap that suits your lifestyle and surroundings. Burlap is made from the jute plant. Jute comes from the outer skin of the jute plant grown in places that get lots of rain, parts of India for example. The jute plant only takes 4-5 months to reach maturity so it’s a smart choice for a renewable, sustainable material. It’s second to cotton in terms of production volume of a natural fiber worldwide – like cotton, it can be used in many industries and applications. 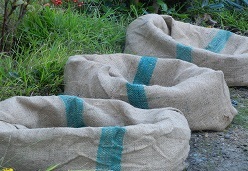 To use burlap sacks, place the bags directly on the ground, as a rectangle, horizontal tube or upright with rolled edges. If you have a patio, some kind of barrier between the bag and wood, stone or cement would work well to prevent staining. Vertical gardening is a wonderful concept although gravity is working a bit against us here with soil inside and so keeping the bags from falling over requires some support – you could use wire fencing or do what I do and group bags together so they can support each other. This especially works well when growing potatoes in burlap bags. I have another video that provides you the details and some fun on growing spuds in sacks – when you get a chance, maybe take a look at that one too. There are several reasons why plants grow well in burlap. Aeration: the weave of the fibers make it easy for air to circulate unlike plastic or clay. 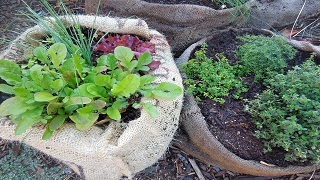 The burlap retains moisture but at the same time let’s water flow through much better than many containers. I like burlap because it’s lightweight. I’ve made planting beds out of retaining wall, wood and rocks and as long as my planting areas don’t look junky, I’m fine with the less permanent look. I like to experiment and switch things up every once in a while anyway so this approach fits my personality as well. Strawberries, they love to be mounded and aeration is important. 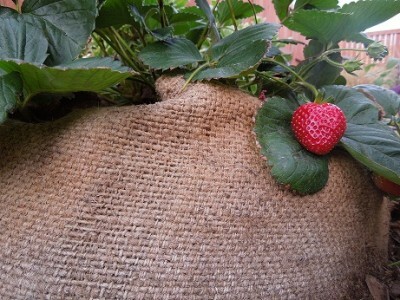 Our strawberries look really healthy when grown in sacks and produce a good crop. Herbs look so natural in burlap and it makes me feel like I’ve created an herb garden that meshes well with its surroundings. Burlap provides a neutral color that lets the herbs take center stage. Lettuce works well because the soil depth doesn’t need to be very deep for lettuce, arugula and spinach. I do start the seeds inside or in small containers first, or buy starts and transplant them into areas of the bag by cutting slits spaced apart. i’m getting into this Burlap gardening trend. I’m about to start my first grow. Hi Cindy. Great website! I had been looking for some sort of eco-friendly grow bags and was delighted to find your info on using burlap bags. Thanks so much! Question: I live in Carlsbad and would like to know whether there’s a way I could purchase (and come pick up) a couple dozen burlap bags directly from you, contributing to your income, rather than buying them elsewhere. Many thanks. I hope you find some reasonably prices bags. Not as cool looking, old pillowcases might work too. I also just made pots out of cut off jeans. Did you ever visit me at the Vista Farmers Market where I had a booth last year? I sold all kinds of inventive seed products, a potato planting kit with bags, loofah starts and more. I am also writing my first eBook for Kindle entitled “You Used WHAT on your Tomatoes?” – DIY Recipes for the Garden – Make your own natural fertilizers and soil amendments from materials around the house. It’s an entertaining guide that shows/explains all the garden concoctions I’ve made over the years, some of the science behind each and quick reference lists. Please stay in touch and maybe visit me on Facebook when you get a chance! I hope you find several that you like! If you email your address to me at cindy@homegrownfun.com I’ll send out first thing Monday morn. Again, thank you for your generous gift! I’ll be posting images of my work on Facebook and HomeGrownFun.com and would also like to publish your first name in the greenhouse next to a plant for fun – hope that’s ok! Thanks so much for graciously sharing your seeds! After a 3-1/2 year wait, I just got a plot in our local community garden, so I’m having a lot of fun preparing it. Since I’ve rediscovered gardening, I’ve met the most amazing people! So open and kind, even amid the chaos of the world we live in. I’m especially grateful that you are helping children learn about seeds and the magic of growing them. So thank you for this gift of yours to our future generations and to our precious planet. Wonderful! Good for you and look forward to your email! Thank again. I saw your question about finding coffee sacks. I’m in Encinitas, so your Carlsbad location caught my eye. If you are still looking for coffee sacks, Pannikin roasters in the Leucadia section of Encinitas on Coast Highway 101 (west side) sells empty coffee sacks for $1 each. There is a stack of folded sacks downstairs in the roasting area. Choose your bags and carry them up to pay for them at the retail area where beans and tea are sold on the far right of the main floor, beyond the food service counter.